The Chopin Bench in Havana (Adam Myjak); photo: T. Tarabula. 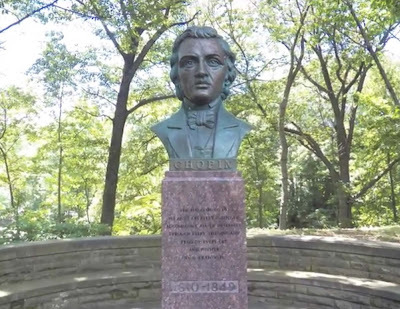 It is strange, with American Polonia being so patriotic and so attached to the Old Country, to find such a dearth of Chopin monuments in the U.S. So far, Cleveland, Buffalo, and Chicago are on the list. If you are in Cleveland, Ohio, go to visit the Polish Cultural Garden, at the corner of St. Clair and East Boulevard. The Garden was dedicated in 1934 and originally contained an elm tree brought from Poland and planted there. In the center there is a large fountain surrounded with sculptures of notable figures from Polish history and culture, including Fryderyk Chopin. "At the center of the Polish Cultural Garden stands anoctagonal fountain decorated with allegorical figures that represent music, literature, science and astronomy. It has an ornamental border of jumping fish and small carved turtles along its base. The fountain was dedicated to the daughter of 16th century poet Jan Kochanowski. The little girl's death at 2 ½ years of age prompted Kochanowski to write a series of 19 elegies. Fittingly, the fountain was built largely by the help of small donations from schoolchildren. It was dedicated in 1953. Surrounding the central fountain are seven busts showing Polish notables. All the busts were dedicated between 1947 and 1966. Among the notables are 19th century composer and pianist Frederic Chopin (1810-1849), 16th century astronomer Nicholas Copernicus (1473-1543), and 20th century physicist and chemist Maria Sklodowska Curie (1867-1934)." The notables also include composer Ignacy Jan Paderewski (1860-1941), as can be seen in the tour of the garden posted on YouTube by a certain Mr. Polonia Music (thank you!). All the historical figures depicted in these white marble or bronze busts, on rectangular red marble or granite columns look solid, healthy and "proud to be Polish." 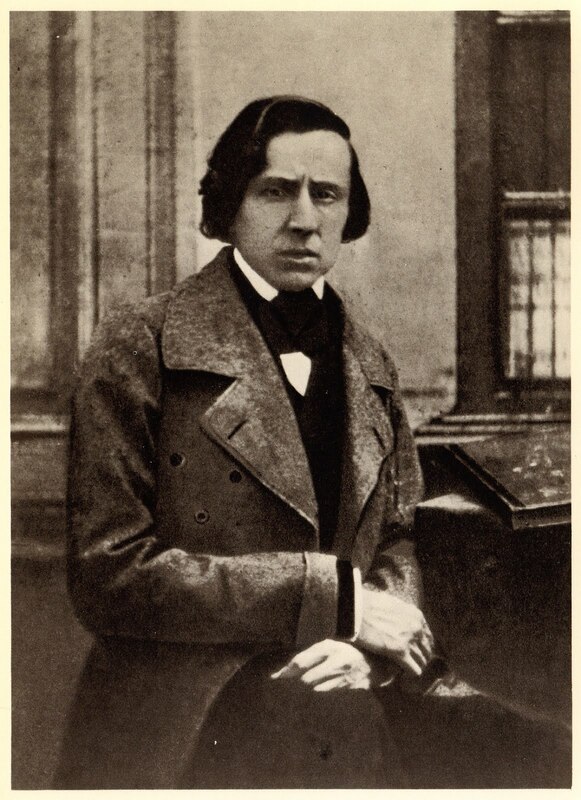 Accordingly, the young Chopin looks strong and healthy, with full cheeks, and hopeful gaze straight ahead. Here's the young man ready to conquer the world as he leaves Poland to start his career abroad: Vienna, Stuttgart, and Paris await... The elegant evening attire with a bow-tie, vest and jacket indicates a 19th century concert pianist, a Music Master in control of his future, ready to step into the limelight. 19th Century Vintage Chopin Postcard. Maja Trochimczyk Collection. 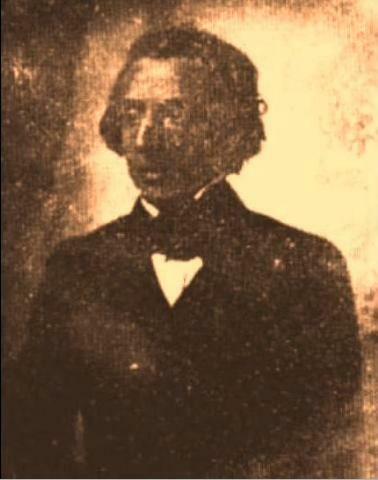 The second known Chopin photograph (daguerreotype). Here I would like to acknowledge the assistance of Ewa Sobotowski and Greg Witul who helped me find Cleveland! Chopin Monument in Buffalo, NY. Photo by Greg Witul. "Buffalo's Chopin Monument was a gift to the city courtesy of the Chopin Singing Society. Executed by Polish-American artist Joseph Mazur, the bust was dedicated June 7, 1925 in Humboldt Park. It was later moved to the front lawn of Kleinhans Music Hall facing Symphony Circle." So, now we know... But in Chicago, Chopin monument exists only as a plan, not in the present. There is a very ambitious plan to erect an exact replica of Warsaw's Chopin Monument by Wacław Szymanowski in the Art Nouveau style (see Chopin Monuments Around the World I - Warsaw). The monument will be located in Chicago's Grant Park, the section between 11 St. & South Michigan Ave. and Museum Campus- Metra Station. Apparently, the organizers of the project hope that this location "will expose it to the greatest number of people of Chicago and tourists alike." The project is called the "Chopin Garden" and donations are sought from the general public. Let's return to our tour, then... Interestingly, there are other Chopin-themed places in Chicago: The Chopin Theatre, Chopin Park, Chopin School, and the Chopin Plaza. These are not monuments, though and I have not found any other Chopin monuments in the entire continental United States. 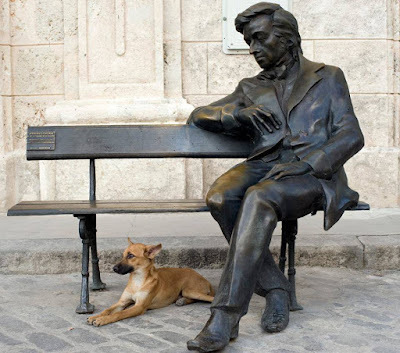 The Chopin Bench in Havana, sculpted by Adam Myjak; photo: Taida Tarabula. We all have set on a bench with someone: I keep visiting Benjamin Franklin in Santa Barbara, but have not yet rested next to Fryderyk Chopin in Havana, in the Plaza de San Francisco, just opposite the former home of the Marquis of San Felipe and Santiago. The simple and modern Chopin Bench encourages passers-by to rest a while with the peaceful, serene composer. In the photo a dog decided to take a break at his feet. How homely and sweet. A good reason to go to Havana and hang around with the bronze Chopin. Note the turned head, inward glance, and the long pianist's fingers of the right hand splayed in a gesture that reflects a chord or a phrase "heard" by the composer capturing music as it is born, in statu nascendi. What piece would fit with the mood of this sculpture? Perhaps a Waltz (Op. 64, No. 2, in C-sharp Minor, played by Evgeny Kissin), or an Etude (Op. 10, No. 3, in E Major, played by Maurizio Pollini)? The Etude, with one of the most memorable Chopin's melodies, seems more appropriate. Photo by Christopher Ziemnowicz, from Wikipedia (Wikimedia Commons). 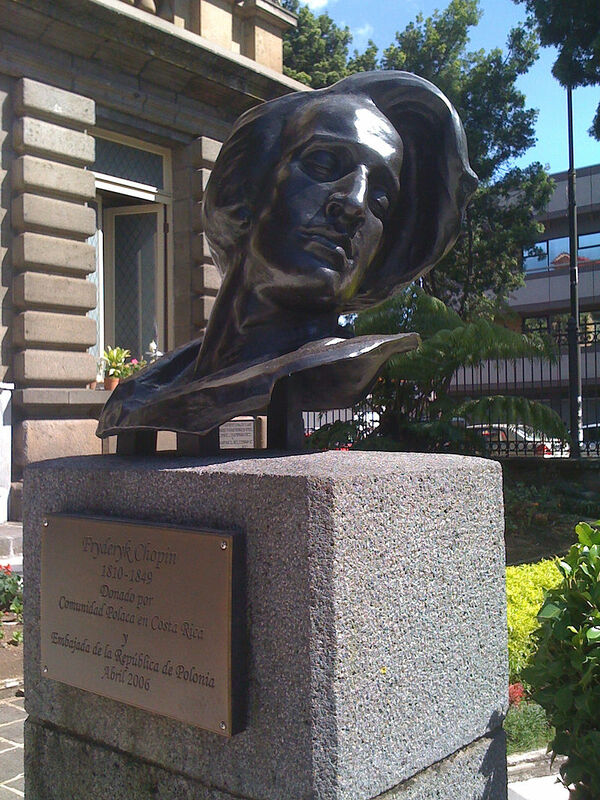 The bust of Chopin is placed in front of the National Theater in San José, Costa Rica. Donated by the Polish community in Costa Rica and dedicated in April 2006, it is one of the newest Chopin portraits that we will encounter on our worldwide tour. While being new, it draws from older models, in particular Waclaw Szymanowski's sculpture from the Lazienki Park in Warsaw, Poland. The flamboyant hair is moved by the wind towards the composer's left shoulder; the hair is parted on the right, similarly to that sculpted by Szymanowski for Warsaw, but atypical for the composer. The facial expression - with lowered eyelids, and closed mouth - also resembles closely the Szymanowski model. The mood is more serene, though, the brow is smooth, without a trace of the frown marking the earlier sculpture. 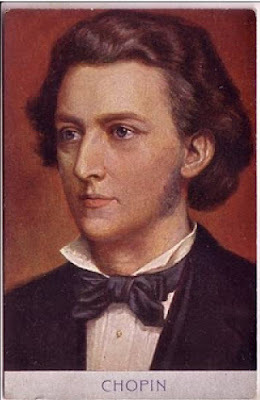 As we see below, Chopin parted his hair on the left; if the wind blew from the right, we would not be able to even see his eyes, covered by the mess of the long hair... But the artists have rights to creative freedom: licentia poetica. Chopin in 1849, daguerreotype, one of two known photos of the composer. 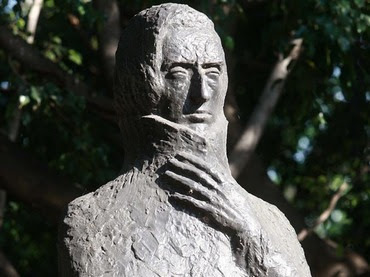 Even Guadalajara in the state of Jalisco, Mexico, has its Chopin statue. The Monumento a Federico Chopin is located in Jardín Chopin on Avenue Alcalde (colonia de Barranquidas), 44260 Guadalajara, Jalisco, Mexico. 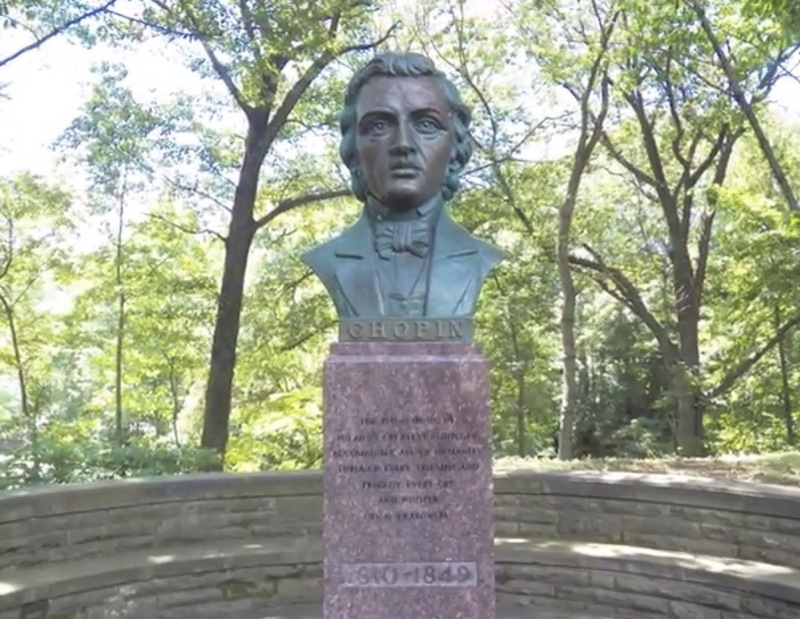 It was unveiled in 2001 to honor the beloved composer, described as the father of modern music, a romantic, poet of the piano, and an artist apart. Chopin is a serious father-figure here, erect, foreboding, with the dry air of a Master, like J.S. Bach in his powdered wig... He is frowning, with eyes reduced to narrow slits looking straight ahead, without a smile. Perhaps it is the cold: his elongated, elegant fingers hold the collar of his jacket upright, wrapped tight around his neck. Here is an image from the freezing land of blizzards and snow right in the middle of a Mexican park. Unfortunately, I do not know if the sculpture is of the full figure, or just the bust. It appears the former. Its rough "unfinished" texture indicates its modernist provenance and aesthetics. According to an article from The Warsaw Voice (July 2003), 130 monuments connected with Poland are located in South America. The majority are in Brazil (61) and Argentina (36); with smaller numbers in Peru (10), Chile (7), Uruguay (7), and Mexico (5). Apparently, Nicaragua has two Polish-themed monuments while Guatemala and Colombia have one each. 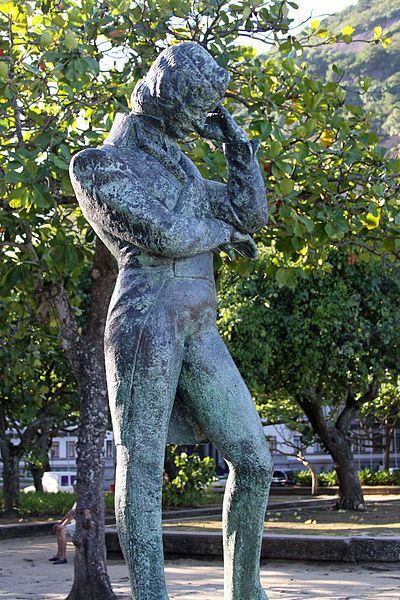 Six of these monuments are dedicated to Frédéric Chopin; they may be found in Brazil, Argentina, and Chile. 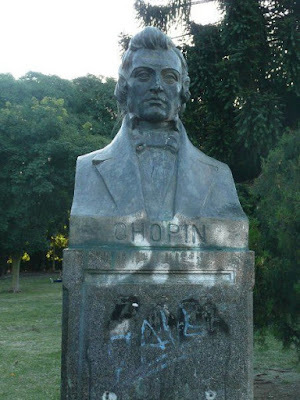 The oldest monument of Chopin in South America was built in 1943 and unveiled in 1944 in Rio de Janeiro. It was designed by August Zamoyski, Polish sculptor who spent the war years in Brazil but returned to France afterwards. Count Zamoyski (June 28, 1893 in Jabłoń, Poland – May 19, 1970, Saint-Clar-de-Rivière, France) was a member of Polish art groups Bunt and Formiści. His stone compositions, initially influenced by cubism and futurism, were characterized by simple, geometric form, with classical leanings. The simple, classic and expressive sculpture captures the nostalgia of Polish exiles that escaped from war-torn Europe to Brazil, yet longed for what they left behind. The emotional "tone" of the image is also well attuned with the mood of Chopin's nostalgic and sorrowful mazurkas. The position, turned away from the world, bent over to look inward, in solitude at the edge of the ocean, also captures the personal, intimate, individual tone of Chopin's music. 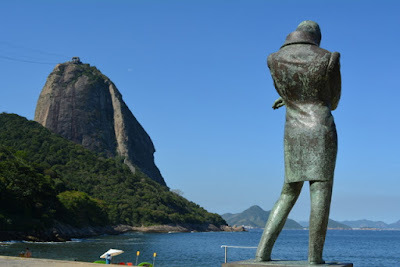 It is my favorite monument and one day, I'll go to Rio de Janeiro and stand on the shore of Playa Vermelha, right next to Chopin, lost in thought, an exile in the New World. 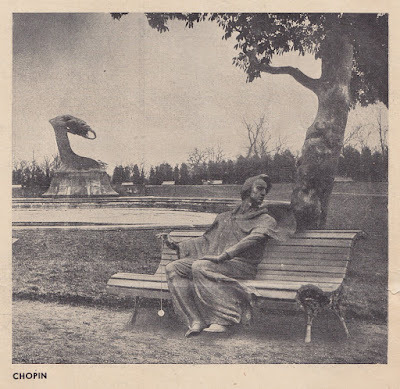 In 1963, a monument of Chopin was created by Fernando Corona for Porto Alegre in southern Brazil; it was unveiled on 15 November that year. 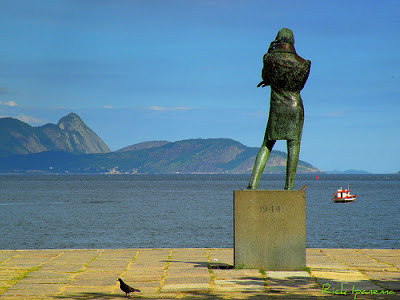 For those who have not been to Brazil (including me), Porto Alegre is the capital and largest city in Brazil's state of Rio Grande do Sul, the southernmost part of the country. 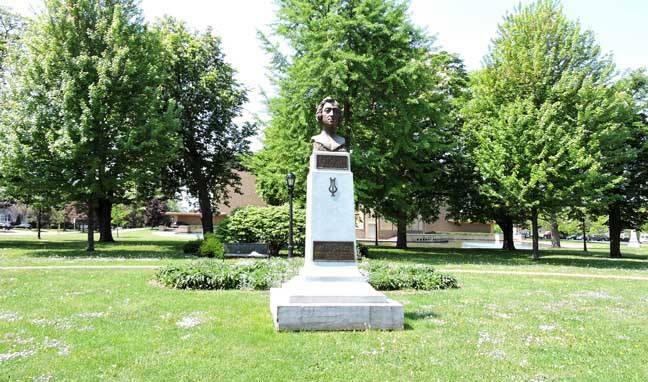 The sculpture is actually a portrait of the composer, placed on a simple square granite column with the appropriate inscription marking the anniversary the monument is celebrating: 1810-1960, the 150th anniversary of Chopin's birth. The Polish composer is recognizable by his long hair and the unique hair style, but the face does not seem to be modeled on any of his known portraits. What seems quite authentic, though, is the expression of sorrow, so typical in images of this most romantic among the romantics. Interestingly, the best­-known Polish-themed monument in Brazil is not of Chopin at all. It is the statue of Christ the Redeemer (Cristo Redentor) in Rio de Janeiro. A panoramic view of the statue at the top of Corcovado Mountain with Sugarloaf Mountain (centre) and Guanabara Bay in the background. by Artyom Sharbatyan. Wikimedia Commons. This 37­-meter­ high sculpture was designed by Paweł Maksymilian Landowski. Having graduated with a fine arts degree in Paris, Landowski became the official sculptor of the Third French Republic. He was the creator of the tomb monument of Ferdinand Foch, Marshall of Poland and France, built in 1937 in Hôtel des Invalides in Paris. 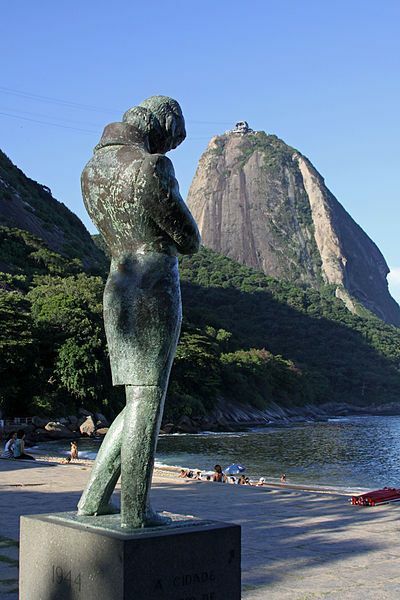 Landowski’s monument—weighing 1,145 tonnes and unveiled in Rio de Janeiro in 1931—has become a symbol of Brazil. 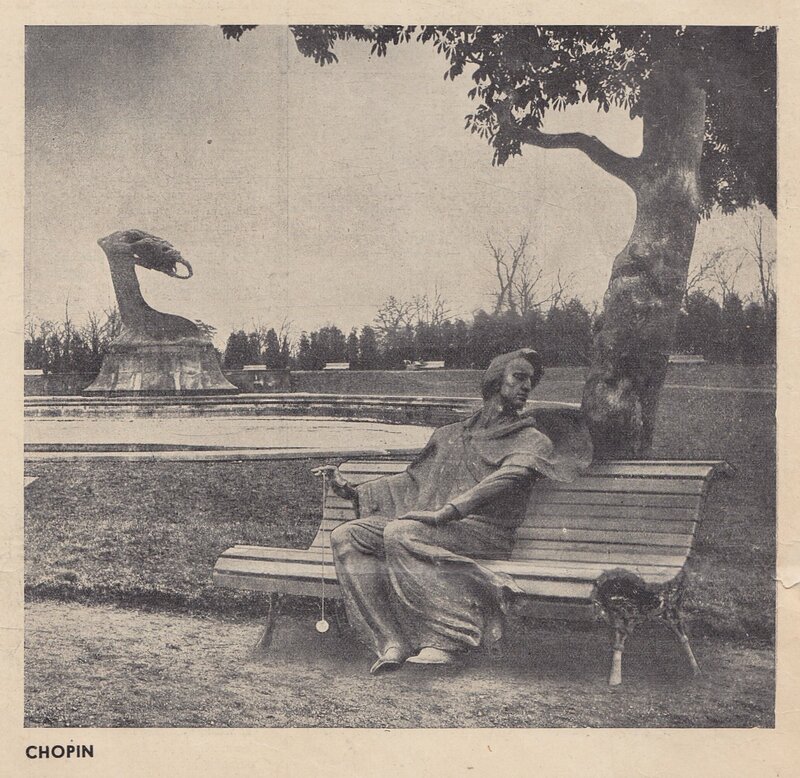 In 1944, a Chopin monument was unveiled in Buenos Aires, Argentina. This appears to be the work of Polish exiles that found their temporary shelter in the New World. These included Polish composer and conductor Grzegorz Fitelberg (1879-1953), so perhaps some information about this monument could be found in his biography? The outbreak of the war found him in Paris from where he traveled to Buenos Aires a year later. He worked as a conductor for the Teatro Colón in the 1940-41 season, but later moved north to the U.S. He worked mainly on instrumentation and conducting, and performed in cities such as New York, Montreal and Toronto. Monumentos y Estatuas de Buenos Aires. It does not seem that the sculptor knew many images of Chopin nor that he had any other purpose of portraying the Polish composers than adding him to the list of illustrious Europeans celebrated in South America. Perhaps a group of local Poles could polish this symbol of musical Polishness? (Sorry, could not avoid the bad pun). Unfortunately, that's all I know. Maybe some of my readers can help and send a more detailed account of this sculpture's history. Let's conclude a visit to Buenos Aires with a recording by Martha Argerich, who won the International Chopin Competition in 1965. There are so many excellent interpretations: maybe you have time for a lyrical and expressive Ballade (No. 1, Op. 23, in G Minor, 8 and a half minutes), if you want more, how about the series of Preludes, Op. 28 (over half an hour of music) or a Piano Concerto No. 1 (played with a Polish orchestra, Sinfonia Varsovia, conducted by Grzegorz Nowak)? For those with absolutely no time, there is always the two-minute classic 1965 recording of the electrifying performance of the Etude in C Major, Op. 10 No. 1 that gave the unknown Argentinian first prize in a Competition by default skewed towards Slavic men. Apparently, another bust of Chopin has been unveiled in the capital city of Chile. The same story, only worse: I do not even know the date. Thus we traversed the Americas, from the north to the south, finding many more Chopins in the Latin-inspired countries of South America than in the cold, Protestant U.S. Perhaps my sources are missing monuments that I should have known about but do not. Again, a request to my readers. 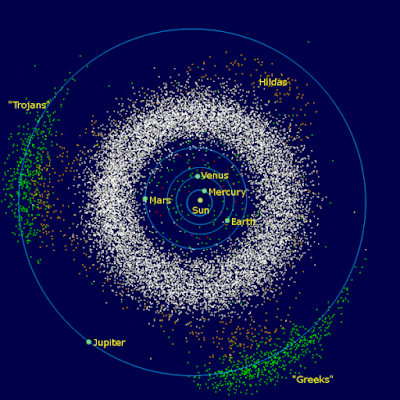 Asteroid belt and location of asteroids in the Solar System. From Wikipedia. As if the Earth was not enough, astronomers honored Chopin among the stars. He does not have a planet yet, but does have a crater on Mercury and has an asteroid dedicated to him: Asteroid No. 3784. This is one of the small bodies orbiting the Sun; neither a planet, nor any of the planets' moons, nor an active comet. There are millions of asteroids in different sizes, the majority of them located in an orbit between Mars and Jupiter, as shown above. Some scholars speculate that these multiple asteroids are fragments of a destroyed planet that was orbiting in that spot. In any case, it is certain that we owe the extinction of dinosaurs to the collision with an asteroid that fell on Yucatan Peninsula or the nearby Gulf of Mexico 65 millions year ago. . . Hopefully the Chopin asteroid will behave better! "Asteroidsscale" by NASA/JPL-Caltech/JAXA/ESA - http://dawn.jpl.nasa.gov/multimedia/images/571372main_pia14316-43_800-600.jpg. The Asteroid 3784 Chopin was first seen on October 31, 1986, photographed from the Haute-Provence Observatory in France, by Eric Walter Elst, a Belgian astronomer and a prolific finder of asteroids: he spotted over 3,000 of them! We do not know where does it fall on the asteroid scale of sizes reproduced above. 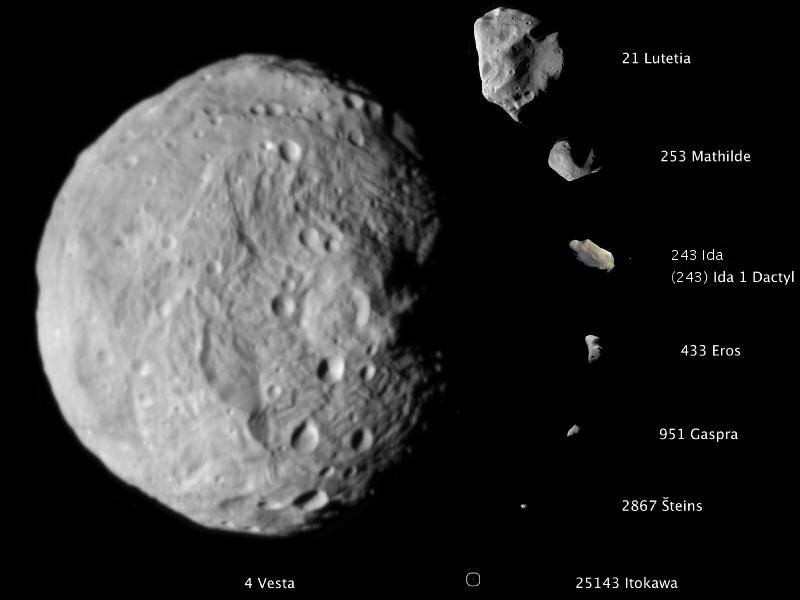 The largest of these asteroids, Vesta, is the size of a pea, when compared to a golf-ball of the Moon. Pretty tiny! 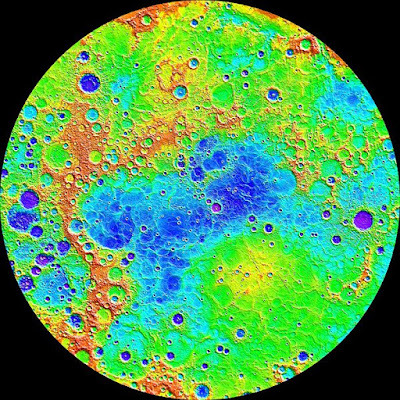 There is another astronomical site dedicated to Chopin: The Chopin Crater on the planet Mercury. With a diameter of 129 kilometers. and located at 65.1°S 123.1°W, this crater was named after the Polish composer by the International Astronomical Union in 1976. Chopin is in pretty good company here. There are 398 craters named after historical figures from all countries and cultures (see the site Planetary Names: Mercury: Craters). I spotted the names of numerous composers, among writers, poets, artists, painters and philosophers, mostly male. The forty seven composers are: Johann Sebastian Bach, Bela Bartok, Ludwig van Beethoven, Johannes Brahms, Fryderyk Chopin, Piotr Czajkovskij (Tchaikovsky), Aaron Copland, Francois Couperin, Claude Debussy, Anton Dvorak, Duke Ellington, Mikhail Glinka, Christoph Willibald Gluck, Edward Grieg, Percy Grainger, Friedrich Handel, Joseph Haydn, Gustav Holst, Charles Ives, Leos Janacek, Scott Joplin, Krzysztof Komeda, John Lennon, Franz Liszt, Guillaume de Machaut, Gustav Mahler, Felix Mendelssohn, Thelonious Monk, Claudio Monteverdi, Wolfgang Amadeus Mozart, Modest Mussorgski, Sergei Prokofiev, Giacomo Puccini, Henry Purcell, Sergei Rachmaninoff, Maurice Ravel, Domenico Scarlatti, Arnold Schoenberg, Franz Schubert, Jean Sibelius, Bedrich Smetana, John Phillip Sousa, Tansen (from the Mogul Court in India), Giuseppe Verdi, Heitor Villa-Lobos, Antonio Vivaldi, and Richard Wagner. Measurements from MESSENGER's MLA instrument during the spacecraft's greater than four-year orbital mission have mapped the topography of Mercury's northern hemisphere in great detail. The view shown here is an interpolated shaded relief map of these data. So let us drink some tea, listen to Chopin's Berceuse played by Tatiana Shebanova (the most astounding image of a cosmic flight in all his music), and smell the roses! NOTE: Since I have not visited any of these monuments myself, I thank all photography authors and sources of photographs, which are used here in accordance with non-commercial fair use open source principles of Wikipedia, and Wikimedia Commons, from where most of the photos are copied.